The first day of 2016 is an auspicious day in Vermont as it unveils the first mandated US primary (single-use) battery recycling program. For the past 18 months, Call2Recycle has been developing a primary battery recycling program that complements its existing rechargeable program. The following Q&A answers some common questions about this new chapter in US battery recycling. For more details, visit the Vermont page on our web site. What is the Vermont primary battery law? Signed into law in May 2014, Vermont Act 139 is the first single-use battery product stewardship law in the US. The law makes Vermont the first state to require battery producers to finance collecting and recycling single-use batteries they sell into the market and to encourage consumer recycling through public education and outreach programs. What types of batteries are covered under this law? A primary battery is defined as a non-rechargeable battery weighing 4.4 lbs, (2 kg) or less, including alkaline (AA, AAA, C- or D-cell, 9v), carbon-zinc and lithium metal batteries. The law excludes batteries intended for industrial, business-to-business, warranty or maintenance services, or non-personal use; a battery that is in or with a product; and a battery that is sold or used in a medical device. Who is required to participate in the program? Any producer of primary batteries (including private brands) weighing less than 4.4 lbs, (2 kg) that are sold in Vermont as of Jan. 1, 2016, are responsible for financially supporting the end of life disposal of their batteries. Producers can administer their own stewardship plans or participate in an approved stewardship program like Call2Recycle. What if a company doesn’t participate? Non-participating producers face possible state penalties, legal actions by stewardship organizations seeking to recover their collection costs, and a ban on selling primary batteries in the state. Which producers are supporting the Call2Recycle program in Vermont? Twenty-four producers have selected Call2Recycle as their stewardship organization to fulfill their requirements under the law, including those listed below. Family Dollar Stores of Vermont, Inc.
To make it as easy and convenient as possible, Vermont’s Call2Recycle program is designed to be similar to the rechargeable battery program it has administered in the state for the past 21 years. Consumers can recycle any batteries at any drop off locations listed in our drop-off site locator. The program is offered at no cost to both the collection sites and consumers. What is different about this program from the current programs? There are two big changes. First, Call2Recycle has expanded the battery types being collected to include both rechargeable and primary battery chemistries listed above. The second change is to the collection process. 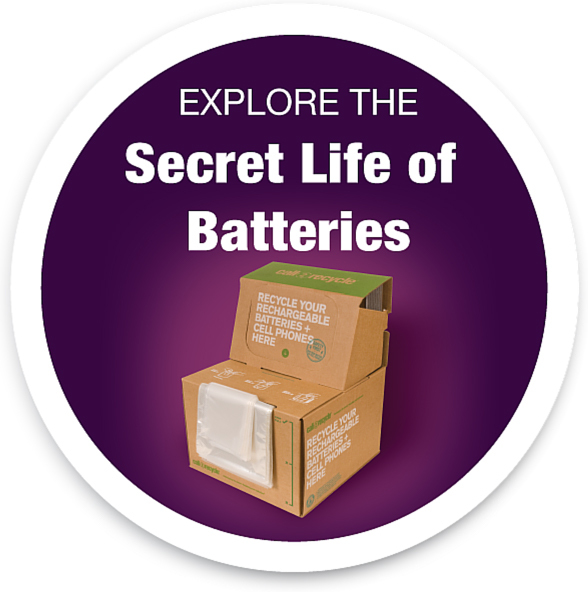 Consumers no longer need to separate their primary and rechargeable batteries. Where are the collection sites? Call2Recycle has 140 rechargeable battery collection sites in Vermont — all within 10 miles of 86% of Vermont residents. We expect the number of locations to expand between 30 to 35% during 2016. Retailers that sell primary batteries in Vermont can opt to serve as collection sites, but they are not required to under the law. Nearby collection sites can be easily found by entering a zip code or address in the Call2Recycle online and mobile drop-off site locator. For more information or to participate in Call2Recycle’s plan, contact Todd Ellis, Director of Stewardship Programs at Call2Recycle.